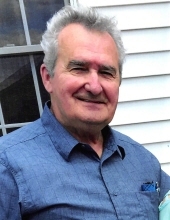 Kerry Charles Ernst, 81, of Lincoln, passed away Sunday, March 17, 2019. Born to Charles and Mary Ellen (Hartman) Ernst on October 23, 1937 in Reading, Pennsylvania. US Air Force Veteran. Kerry was a family man, who enjoyed spending time with his children, grandchildren, and great-grandchildren. He enjoyed participating with the Shim Sham dancers for many years. Kerry retired from Quebecor after 25 years. He is survived by his wife; Elaine, daughters; Kim (Dale) Haseloh, Pam (Cliff) Dixon, Tracy Martin (Steve Smith), Holly (John) McManus, grandchildren; Autumn (Al) Short, Erik (April) Daharsh, Ryan (Tonya) Daharsh, Mallory Daharsh, Everett McManus, Lydia McManus, Jessy Johnson, Laura Martin, granddaughter-in-law; Michelle Daharsh, great-grandchildren; Aris, Aston, Arden, Augustus, Adler Short, Helen, Alana Walenta, Rainna, Larkin, Talon Daharsh, Keely, Khloe, Koen Daharsh, Taryn, Tayah, Samson Daharsh, Ava, Adeline Slechta, Baby A Barker. He was preceded in death by his granddaughter; Jamie Walenta, grandson; Nick Daharsh, son-in-law; Marty Martin. To send flowers or a remembrance gift to the family of Kerry Charles Ernst, please visit our Tribute Store. "Email Address" would like to share the life celebration of Kerry Charles Ernst. Click on the "link" to go to share a favorite memory or leave a condolence message for the family.